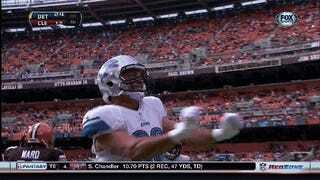 With a three-touchdown game today, Joseph Fauria deserves more recognition. He now has five TDs this season; Calvin Johnson has four. There's no reason why Fauria shouldn't be stealing more of fellow tight end Brandon Pettigrew's snaps. Oh yeah, he danced again for his third score. Enjoy.